Wholesale energy prices have dropped significantly during October 2018 – UK’s gas and electricity annual prices decreasing by just over 10%; crude oil prices also decreased about 10% too. However, spot UK energy markets were volatile, driven primarily by changing short term weather forecasts. Forward curves for rolling annual prices reduced its backwardation compared to last month, demonstrating a weakening in market sentiment. Longer term trends are still uncertain, and further evidence that the market has turned bearish is necessary. Whereas within-month gas markets were quite volatile this month, as day-day weather changes impacted demand, generally supply was good, with ample LNG and Norwegian availability such that forward prices eased off significantly, resulting in annual wholesale price drops of over 10% by the end of the month. 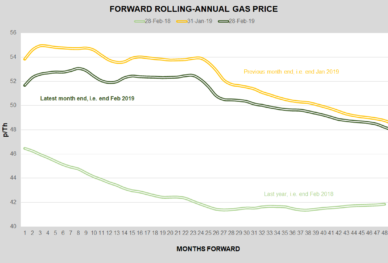 The forward curve for rolling annual prices still shows backwardation, albeit reduced, indicating we could still see further price increases as winter progresses, though until winter weather forecasts firm up, it is by no means certain and is something to be watched over coming months. Interestingly, sterling (£/€) generally weakened over the month due to more Brexit concerns though this did not push energy prices up implying some weakening in market sentiment; an interesting development bearing in mind heating demand for gas will definitely increase over the coming months. UK’s wholesale electricity market, like gas, was relatively volatile on a spot basis driven by fluctuations in day-to-day supply/demand as a consequence of changeable weather conditions impacting temperatures and renewables (wind and solar) production volumes. Forward prices, however, weakened considerably (>10%), despite lower sterling FX rates (£/€ and £/$). Underlying sentiment, as indicated by the forward market structure, which maintained its backwardation, still currently shows an expectation for higher prices over the medium term. However, backwardation in the forward curve for rolling annual prices has reduced, and other technical indications also suggest things could be changing too, though it is too early to be confident that annual prices have entered a new downward medium/long term trend. During October 2018, Brent crude oil prices also dropped significantly, despite global oil demand now being close to new, historically significant peaks at 100 mb/d (million barrels per day). However, supply is also increasing and production has surged, led by the US shale revolution, and supported by big increases in Brazil, Canada and elsewhere. We have also seen signs of OPEC over-production in September/October, which will likely be confirmed in November; all of which have taken the steam out of the oil market for now. 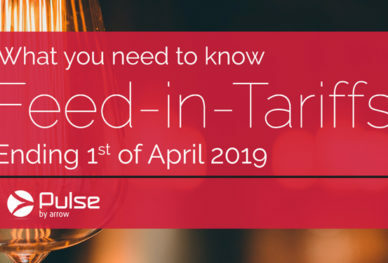 The market appears to be recognising the likely supply-demand imbalance for 2019, mentioned in last month’s report, forcing lower prices as the fact of what is happening in the market follows the rumours and recent political rhetoric, related to the impact of Iranian sanctions etc. Nevertheless, purchasers should not be complacent as Brent is still in backwardation and supply fundamentals, albeit good, can be disturbed. In the end, October 2018 was slightly warmer than seasonally normal for UK, albeit quite variable, and while medium/long term forecasts have suggested a mild winter, some recent forecasts are increasingly anticipating a colder 1Q19, perhaps even extending in to March. Nevertheless, some risk premium has come out of the market and trader reaction to news has been less bullish. So, unless November is very cold or there are any nuclear plant issues in France, we can anticipate that 4q18 prices should not be extreme and any price hikes in 1Q19 should be short lived. As usual, particularly over the coming weeks and months, the key structural indicator to keep an eye on is the extent of backwardation in the market; if the curves steepen again we can view the current market as a dip, however, if the extent of backwardation flattens, we will be looking at this as developing weaker sentiment and potentially a return to contango – we will be watching this. For those looking at so called technical indicators, comparing short term moving averages to longer averages, may also be interesting. That being said, if buyers have the flexibility, holding off from buying now for 3q19 and beyond, and seeing how the market develops over the coming weeks and months, might represent a reasonable risk/strategy, though it would still be prudent to use the current market drop to cover remaining winter 2018 exposures.